Here is a little glimpse into our tiny lifestyle! We bought ourselves something nice this last Christmas. The Cosori Air Fryer! Well we did it. We bought land. Here I talk about my personal growth and a small insight I am going through with purchasing my first piece of land for our tiny houses. Phew what a wild ride so far. Hemp oil and essential oils are a must in our life! Half Baked Bus has taken this to the next level! Insurance can be hard in general let alone finding some for your tiny house. Here is what we went with! One of our biggest tiny house problems was SOLVED when we found this product! Check it out! We recently got the opportunity to check out a product from our friends at Goodlinens. Our friend Allison was kind enough to send us over a towel for our bathroom. At first I was confused. What’s so special about a towel? Answer: Everything. Tim talks about how traveling has changed since going tiny and what he does about souvenirs. Making A Tiny House Your Home? You'd Be Amazed At What You Can Live Without! Wondering what it’s like to live tiny with your significant other? Wonder no more! One year into our tiny journey, we've learned a lot. Want to hear the highlights? Read on, friend! 10 things we love about living tiny so far! 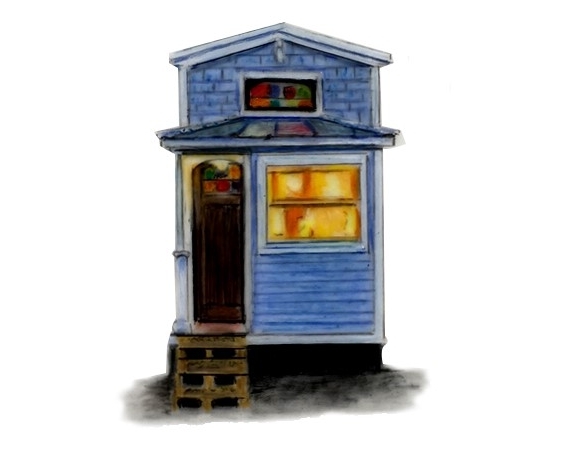 Tiny House Podcast #130 - Blue. Beautiful. Tiffany. We are sooo excited to announce that Tiny House Blog has released the episode we were able to be apart of for "The Tiny House Podcast"! Episode #130 I was our first time on a podcast like this and it was a blast! Whats it like trying to fit our stuff in our home? Well we made a game out of it sorta. Looking to use less plastic in your day to day life? Here's a fun and easy way to reduce your carbon footprint, and spice up your brown bag lunch! I never thought much about an exhaust fan but there is clearly a difference in quality. In this blog post I tell you why and what we chose. Lots of things change when you move from a traditional home into a tiny home. Here is a couple things that have not change. Decorations are decidedly not within the minimalist lifestyle. We decided to deorate for the holidays anyways! See what we deided on in this post!